M Karunanidhi, DMK president and former Tamil Nadu CM, dies at 94 in Chennai hospital: M Karunanidhi, DMK president and former Tamil Nadu chief minister, died at a private hospital in Chennai on Tuesday after prolonged illness. He was 94. The Kauvery Hospital said Karunanidhi died at 6.10pm. “Despite the best possible efforts by our team of doctors and nurses to resucitate him, he failed to respond,” said the hospital in a statement, expressing “deep anguish”. Prime Minister Narendra Modi said on Twitter he was “deeply saddened” by Karunanidhi’s death. “We have lost a deep-rooted mass leader, prolific thinker, accomplished writer and a stalwart whose life was devoted to the welfare of the poor and the marginalised,” he said. The DMK patriarch Karunanidhi is on “continuous monitoring and being treated with active medical support. His response to the medical interventions over the next 24 hours will determine the prognosis,” Executive Director of the Hospital Dr Aravindan Selvaraj said. As several political leaders visit Karunanidhi at Kauvery Hospital, police have been deployed round the clock. A Twitter user posts a picture of personnel resting outside the hospital after a hectic day. Supporters outside Chennai’s Kauvery Hospital where DMK President M Karunanidhi is undergoing treatment. Puducherry CM Visits Karunanidhi | Puducherry Chief Minister V Narayanasamy arrives at Kauvery hospital to inquire about Karunanidhi’s health. In the last 10 days, a virtual Who’s Who of Indian politics – right from President Ram Nath Kovind, Vice President M. Venkaiah Naidu, Congress President Rahul Gandhi, former Prime Minister H.D. Deve Gowda and leaders from various parties including the BJP, Left and others – visited the hospital to express their wishes for Karunanidhi’s speedy recovery. 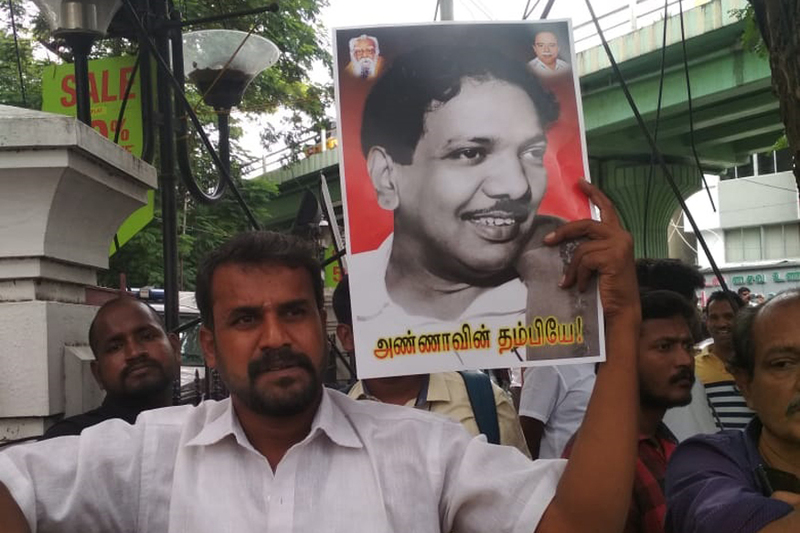 Karunanidhi Supporters Pour Their Hearts Out | One of the woman supporters, waiting outside Kauvery hospital, asks Karunanidhi’s son MK Stalin not to worry. “We are like your mothers and fathers. Don’t worry, Karunanidhi will be healthy again. The sun will rise soon and take away our pain. Karunanidhi will be the chief minister again,” she says. Chaos Outside Kauvery Hospital as Supporters, Journalists Throng Area | Traffic was completely blocked on the road outside Kauvery hospital last night, which slowed down vehicular movement towards the Music Academy and towards CIT Colony/MCTM School from the Eldams Road signal, reported The Hindu. The news report also stated that it was also a ‘tough day’ for the media as ‘onlookers’ routinely sneaked in through the barricades and mixed with the journalists. Tears well up a supporter’s eyes as he anxiously waits to get an update on Karunanidhi’s health outside Kauvery hospital. Kanimozhi Meets DMK Supporters | DMK leader Kanimozhi meets people gathered outside Chennai’s Kauvery hospital where her father and former Tamil Nadu CM M Karunanidhi is undergoing treatment. DMK leader Kanimozhi meets people gathered outside Chennai’s Kauvery hospital where her father and former Tamil Nadu CM M Karunanidhi is undergoing treatment. The hospital stated a decline in his medical condition yesterday. The Supreme Court in 2015 had allowed members of all castes to become priests in all public temples in the state. Dayalu Ammal Visits Husband Karunanidhi | Karunanidhi’s wife Dayalu Ammal visited Kauvery hospital on the intervening night of Monday and Tuesday. According to The Hindi, she visited the DMK chief through the back gate around 2 am, and after nearly 30 minutes, she left the hospital through the front entrance. 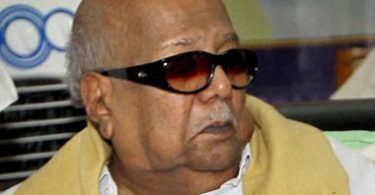 Karunanidhi ‘Not Been Good’ Since Morning | Tamil Nadu Congress Committee president S Thirunavukkarasar, who visited the hospital on Monday, told reporters that Karunanidhi’s conditions had not been good since morning. “Doctors are treating him. 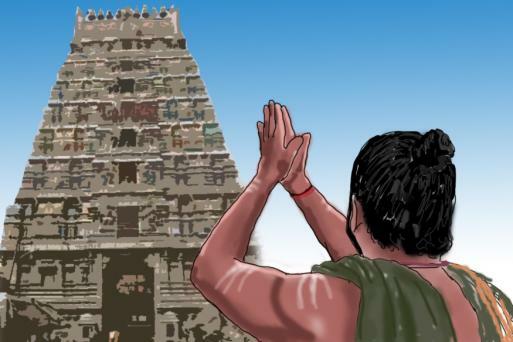 We will have to pray that he gets better,” Times of India quoted Thirunavukkarasar as saying. Crowd Management Measures in Place Outside Kauvery Hospital |Mylapore Deputy Commissioner NK Mayilvahanan is at the hospital. Crowd management measures are being put in place. According to The Hindu, Luz Church Road has been blocked from Nageshwara Rao park towards Kauvery Hospital. Vehicles are being allowed towards St. Isabel’s hospital. Kanimozhi Arrives At Kauvery Hospital to See Father Karunanidhi | Karunanidhi’s daughter Kanimozhi and DMK leader A Raja arrive at Kauvery Hospital early on Tuesday, reports The Hindu. Over 1,200 armed reserve policemen are on standby. 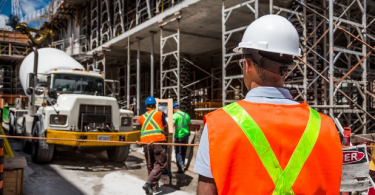 Already, 400 men have been deployed around the hospital. 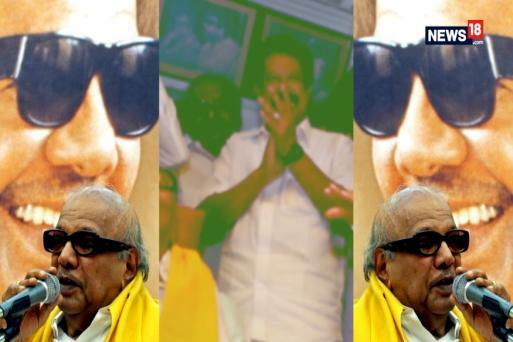 A veteran politician, Karunanidhi has led an interesting life. He enters his 50th year as the President of the DMK party. This video traces the important landmarks which paved way to the Golden Jubilee . Police Deployment Increased on Eldams Road Junction | Cadres, meanwhile, resumed their ‘Ezhunthu Va Thalaiva,’ (Get up leader, come) sloganeering and some of them recited his popular Tamil verses. On the other hand, police increased the deployment of its personnel here as the whole of Eldams Road junction at the upscale Alwarpet area teemed with DMK cadres. Stalin and several legislators, including Duraimurugan left the hospital premises by 10.10 PM on Monday. Mr Karunanidhi, 94, is being treated at his Gopalapuram residence by a team of doctors, a health bulletin issued by Kauvery Hospital Executive Director Dr Aravindan Selvaraj defined so. The bulletin said there was a “slight decline” in Mr Karunanidhi’s health and he is also having the fever because of the urinary tract infection with intravenous antibiotics and fluids. 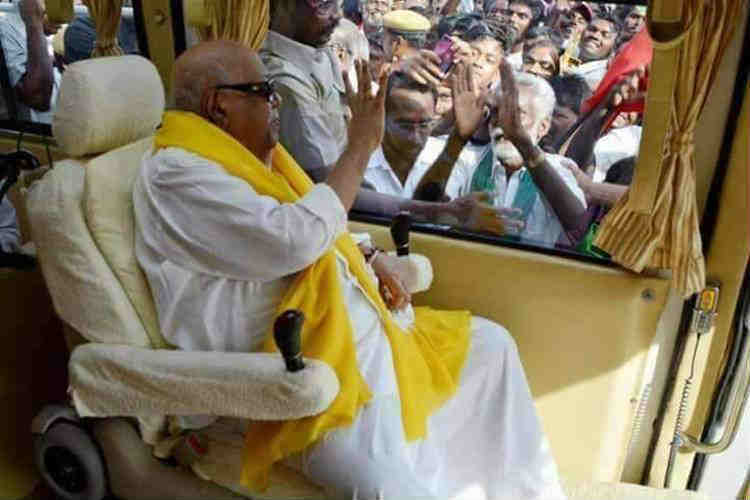 Mr Karunanidhi, who has served as Tamil Nadu Chief Minister five times, is all set to be recovering from a long illness for more than a year and is rarely seen in public. Son, MK Stalin, 65, serves as working president of the party founded by his father’s mentor CN Annadurai, in 1949 and daughter Kanimozhi, a Rajya Sabha Member of Parliament, also holds the key role in the DMK party. The DMK patriarch had returned home recently after a short stay at the hospital where he underwent a procedure to change his tracheostomy tube to help him breathe better. Dr Selvaraj said he is being provided hospital-level care at home and strongly advised the family to restrict visitors. On Thursday, As word about the decline in his health spread some of the political leaders – friends and rivals alike – reached his house. The ruling AIADMK’s O Panneerselvam and fisheries minister D Jayakumar were among the first to reach his residence to have some updates about the Karunanidhi’s health and both of them were seen sitting with the Karunanidhi’s son MK Stalin and other senior DMK leaders. It was Mr Karunanidhi, who helped and inspired Kamal Haasan to join politics back in 1993, and Kamal Haasan also have been seen in the veteran politician’s house. Regarding this entire matter, another politician Mr Jayakumar said that “Mr Karunanidhi will return in good health soon,”.